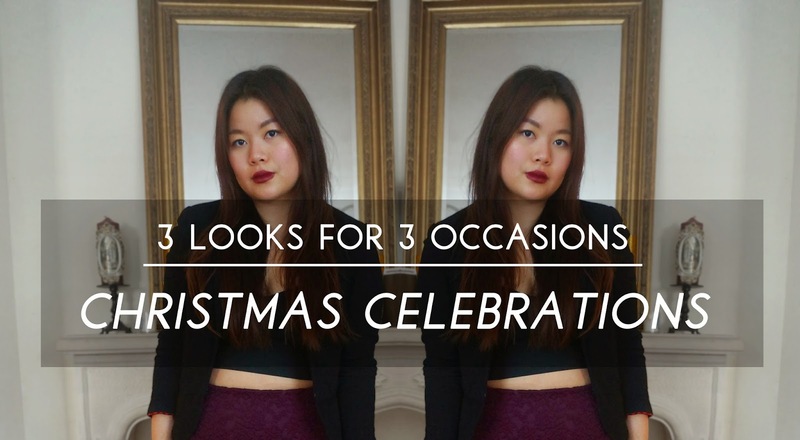 As promised here are my three outfits I wore around the festivities. This time of the year is always the most stressful time for dressing yourself. There's this dinner with those group of friends another with your family and so on. And all of those times you want to dress appropriately and that can take time and some serious preparations. Here are three looks I used for different occasions. The first is a pre-Christmas gathering with friends at a fancy restaurant. The second look is one I used for the mass at church. And the third look is an outfit I wore to have lunch with some friends. I hope to have inspired you with these looks for the remainder of 2014 festivities! Click below to learn more about each look. Since the fancy dinner is with some close friends and at night, it's okay to show some skin (on moderation though).The see through lace is a feminine fabric and the high neck of the dress give the dress a classic look to it. The cropped top and skirt and colour of the dress give the edge and modern feel to it. With this look I could head out straight from dinner to a party elsewhere which didn't happen. This outfit was a bit improvised and last minute, because I got called in to work till 5. But since I was joining the choir for the church mass I had to be early to do final practices. So without really thinking too much I just went and grabbed these pieces together. Although the outfit shows a bit of skin, It still is modest because of the blazer. You can never go wrong with a blazer at such an event. And this blazer probably saved me from indecency. After wearing dresses and skirts a few days in a row, I was done with it and wanted to wear some pants. Pants can be tricky sometimes as it can look too casual, but adding some heels and a good top can do a lot to the outfit. I chose this dresspants since the length of the pants is perfect to wear some heels underneath it. The heels are snake patterned and has a metallic stiletto heel. Since the whole outfit is already monochromatic, this would be a nice touch to it. The top is a faux leather cropped peplum by H&M. Wow I love the blue lace dress! These are such nice outfits, just came across your blog and love it- had to give it a follow!